She is the largest tanker used in the domestic trade, having capacity of 6,000kl and LOA of 105m. For oil trade logistic, crude oil is shipped from outside of Japan to domestic oil refinery where crude oil is refined into produce, such as gasoline. Refined oil products are shipped from oil refinery to oil reserves, and transported to gas stations via tank trucks, then delivered to consumers. MT Tsurufujimaru is used for such shipping mainly all over Japan.Around Fukuoka area, she carries oil from the refineries in Okayama, Yamaguchi, and Oita to storage in Fukuoka. We carry part of gasolines used at gas stations such as ENEOS. Purpose of use: Trading of product oil. Charterer: Tsurumi Sunmarine Co., Ltd.
She is mainly trading about 4,500,000liter ／time of Jet fuel for aircrafts from Mizushima refinery of JXTG Nippon Oil & Energy, in Okayama prefecture, to Kansai International Airport. Hounmaru is the vessel that was owned by Hinode Shipping from 1945 to 1965 and also this was the vessel when we first start business with Tsurumisunmarine. We name this vessel Hounmaru in the hope to value the past to foresee the future, and to bring fortune as the name stands for carrying treasure in Japanese. She supports everyone’s pleasant flight from ocean. MV Star Pathfinder, bulk carrier, was delivered in July 2015, to start the ocean going shipping business. She is Ultramax Bulker having 61,000dwt and about 200m LOA. We name her “Pathfinder” hoping the vessel will be a pioneer for us in the ocean going shipping business. She is our 2nd ocean going vessel, PCTC having 10 decks and some of decks are height adjustable deck that can load not only normal cars but also can accommodate different types of automobiles. Mainly trading in Asia, she calls in Japanese ports frequently. PCTC market is very niche. The hull with red paint and having white “V” on the side, which is the initial of our charterer Vroon, is very stylish. This Vessel is 2,600TEU Container Vessel and being operated in the route from Asia to Africa.She has the longest body of our owning tonnages and her length is almost same as the height of “Hakata Station Building”.The photo is showing the stirring navigation collaborating with Mt. Fuji. We are providing the service of agent business at Hakata Port Aratsu Tank Facility. We work for the clearance of tankers and surveys during the loading of cargo at the port, and also work for vessel’s call/put port process. We also manage the schedule of loading and discharging, and inspecting the loading amount for the third parties. We own a 10-story building and rent rooms for residences and offices at convenient location near the Tenjin / Hakata station. Founded in 1935, our company has been in a shipowning business for more than 80 years. 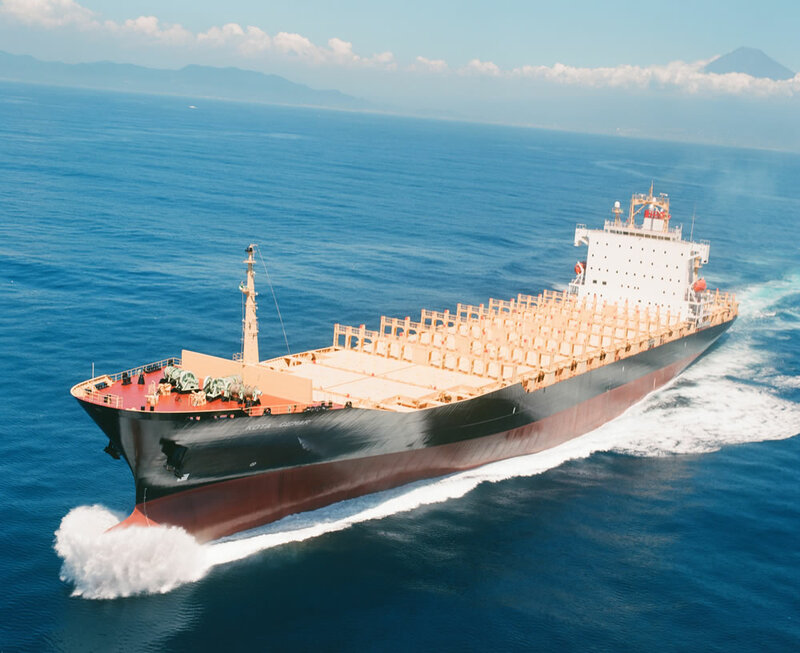 We provide marine logistics services to various products such as refined oil products used at gas stations, jet fuel for aircrafts in Kansai International Airport, iron ole, automobiles, just to name a few. With pride in work and commitment in safety first, we continue to contribute to the society from ocean through stable supply of energy and resources that are indispensable to our everyday lives. Domestic oil tanker business has been our core business for a long time, and at a timing of 80th anniversary of the founding of our company in 2015, we joined ocean going shipping business with Ultramax bulker newbuilding, STAR PATHFINDER. With this vessel, we expanded our business to global marine logistics. We continue to thrive by challenging and accelerating our growth for our 100th anniversary to come in 2035. I appreciate and are grateful for your continued support. Mr. Shigeya Shimizu started the business. Hinode Shipping Co., Ltd was established. Hinode Shipping Co., Ltd started coastal vessel business. MT Daiichi Hounmaru was delivered and chartered out to Tsurumi Transport. Hinode Shipping Co., Ltd started terminal agent business. Hinode Building (head office building) completed. Mr. Shigeya Shimizu was awarded the prize from Emperor to his contribution to Japanese shipping. Mr. Yutaka Shimizu took over the position of the president. MT Tsurufujimaru was delivered from Miura Shipyard. Mr. Mitsuo Shimizu was appointed to be the president. Hinode Shipping acquired MT Hounmaru. (Now JXTG Nippon Oil & Energy ) for the contribution of safety management. 1st ocean going vessel, MV Star Pathfinder (61,000dwt Bulker) was delivered from Imabari Shipyard. MV Le Mans Express (PCTC) was delivered. MV Kota Gemar (2600teu Contener Vessel) was delivered. Copyright HINODE SHIPPING CO., LTD. All rights reserved.